Posted on behalf of my bro-in-law Jason. I’ve had these headphones for over a month now as I wanted to really test them before I wrote a review. I wasn’t in the market for a new pair of headphones but I had been toying with the idea of a wireless set for whilst I’m working. My PC sits on the floor and my old pair of wired Skullcandy headphones doesn’t allow me the freedom to move much at my desk. However, what makes these really stand out is the sound quality and ‘haptic feedback’. Let’s start with the packaging. The magnetic side of the box swings up opening the lid to present you with everything. 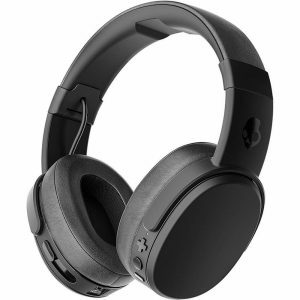 It isn’t on par with Apple in terms of the unpacking being an experience, however Skullcandy certainly wanted to reflect the £130 price tag (or £99 on Amazon). The headphones are presented in a black velvet lined string pull pouch which is emblazoned subtly with the Skullcandy logo. Seating that on a cheap looking piece of moulded plastic did detract a little bit from the price tag impression, but I didn’t buy these for the box. Recessed next to them are two smaller black cardboard boxes, one with the quick start guide and another with Micro-USB charging cable and 3.5mm AUX. Yes, you have the option of having these hardwired instead of Bluetooth. Inside the pouch you have two pockets for both the charging cable and AUX. The headphones left and right ear pieces hinge inwards allowing you to collapse them down for safe storage and carrying. I have seen hard cases if you wanted something more robust to protect them. The headpiece is made from a durable plastic which expands quite well to fit most head sizes and shapes. The padding which runs over the top of your head is just enough in that after about 3 hours solid use I haven’t had any irritation from the headband. Skullcandy have also catered for those with a VR headset. There is a cut-out in the padding in the middle of the headpiece to allow you to wear both VR and these headphones. I don’t have VR so can’t comment to how effective or comfortable it is. There are two small cables which protrude from each ear piece that run into the headband but they are tucked away enough that they don’t snag or catch when adjusting the height. The speakers slide up and down along a solid aluminium rail. It can be a bit tight to begin with when trying to adjust them however it does loosen slightly as you use them more. We are all guilty of ripping headphones off from one arm instead of taking them off properly and the few times I have done this they haven’t required adjusting, something I used to have to do with the cheaper ratchet style of headphones. The padding around the ears is plentiful and very comfortable. They easily encase and block out almost all outside noise. I haven’t had any discomfort from heat build up or unsightly sweat marks from prolonged use, granted you will most likely get that if you use these in the Gym but this is something that will affect all headphones. I do have one criticism with these and that is the size of the speakers is such that I have to adjust the angle of the headphones a couple of times. I find with my face shape the lower portion of the speaker sits on the top of jaw bone. It does put just enough pressure on both sides of my jaw which makes it uncomfortable after about 15 minutes and I have to tilt them back slightly until the pressure goes. But that is flaw in me more than anything. For this reason, I think that if you’re a runner or regular gym goer these will sit snugly and not fall off. As these are Bluetooth they are incredibly easy to pair with your phone. On the right ear are the raised volume controls and the middle button is the on/off and control. Hold for three seconds for power and continue to hold for a further 5 seconds to enter pairing mode and then select it from your phone. Job done. There is an American female robotic voice which tells you when it’s powered on and off but otherwise that’s the only audible feedback I’ve heard so far. The volume buttons also serve extra features depending on what you need to do. If you want to jump forward a track press and hold the +, if you want to go back just hold the -. I haven’t used the built in Mic yet but you can control answering phone calls using the on/off button to be completely hands free. The Aux cable has the same functionality as wired Apple headphones. You have a control switch that allows you to change tracks and answer calls. The great thing is that not only can you have these wired you don’t need to have the headphones powered on to do this. If your battery dies or you don’t need the wireless option you can still use them! To charge you just use the supplied Micro-USB cable and a full charge should give you about 40 hours of runtime. I haven’t drained this down completely yet but upon receiving them I charged them until the indicator turned green. In the month and a half I’ve had them I haven’t had to charge them yet. This is with about 2 hours of use on most days. I was disappointed that there wasn’t a Bluetooth receiver included with this as I was hoping to have wireless headphones at work as my PC doesn’t have Bluetooth built in. Also, the Aux cable is short and the length of which is just enough to reach from the pockets to the headphones. That being said I’m sure you can use a third party Aux to make up for the length. The sound on these are simply amazing, something Wrighty boy can attest to. Seeing his face light up when he fired a Michael Jackson song and hearing every little nuance in the track is a testament to how well these perform. 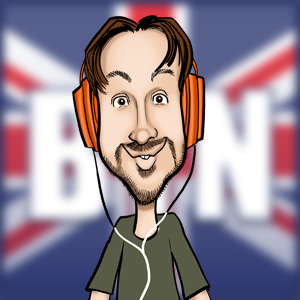 I’ve tried several different genres of music from: Metal, Rock, Classical, Punk, Drum and Bass and pop. Each time every track has a new dynamic to it. It feels as if I am experiencing music for the first time again. It’s beautiful! The ranges in sound are sublime. With classical you can pick out every instrument and hear them with clarity. Drum and bass – which is what I originally heard when testing them in a shop – really show what the headphones are capable of. The bass levels can be manually adjusted using a ‘haptic feedback’ slider on the left ear piece. By moving the slider up you increase the levels of bass and in turn the headphones start to vibrate in the literal sense. I’ve had the volume turned up along with the bass feedback and have watched them bounce on a table! Move the slider back down and you get a flatter sound with no bass. There is potential to damage your hearing if you choose to have everything on max. They are loud enough that when Paul went in one room in his house and removed them I could hear the song he was listening to, whilst I was in a different room! They’re that powerful. As you can imagine if you had the volume up loud enough with the bass, others in a quiet(ish) room will be able to hear what you’re listening to. Once the novelty wore off I found that what worked for me was to play with the settings on a genre or track to track basis. What would be great would be to have an Official App in which you could have presets to meet your requirements. For example if you plan on listening to Club music you would set the Equaliser, high and low ranges, bass levels etc and then apply them. That would really take these to the next level. For me I have the feedback slider set to give enough bass and a slight vibration. I love these. I find that most in-ear headphones to be tinny in their quality and they leak so much sound to the point of it being detrimental to the musical experience. I’m no audiophile but I want to hear everything in the songs I have paid for, and these let me do it. If they broke tomorrow I would buy another in a heartbeat.